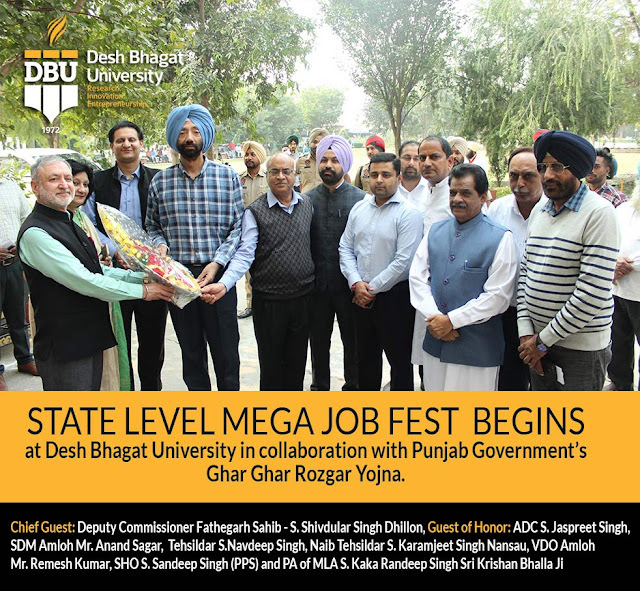 In best university in Punjab and top universities in India, Desh Bhagat University with the Collaboration of Punjab Government organized a State Level Mega Job Fest, at its campus. 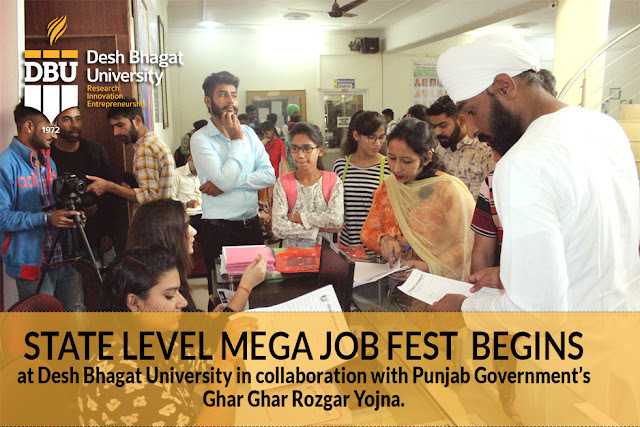 The three day long fest going to target the students who are Graduates, Post Graduate in various streams like Management, Engineering, Business Administration and Computer Applications etc. 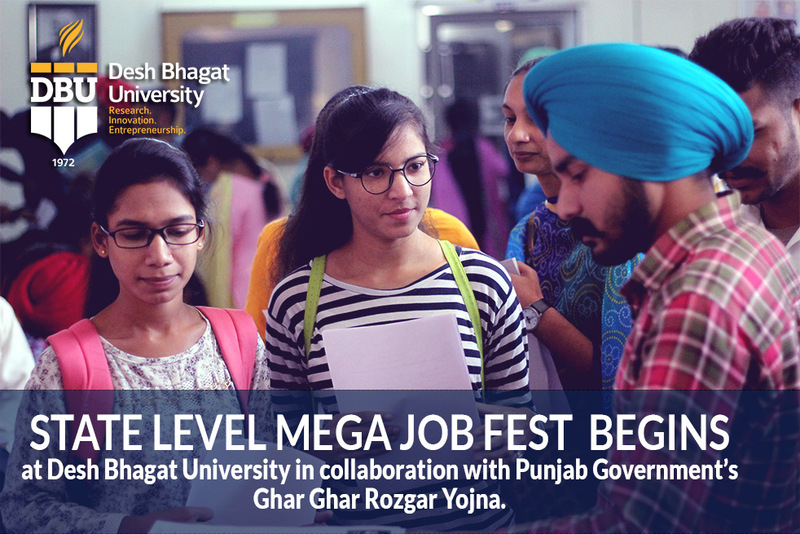 The Fair is going to be attended by large no of students from all over Punjab. Chief Guest Deputy Commissioner Fathegarh Sahib S. Shivdular Singh Dhillon inaguarated the Maga Job Fair along with guest of honors ADC S. Jaspreet Singh, SDM, Amloh Mr. Anand Sagar Tehsildar S.Navdeep Singh, Naib Tehsildar S. Karamjeet Singh Nansau, VDO Amloh Mr. Remesh Kumar, SHO S. Sandeep Singh (PPS) and PA of MLA S. Kaka Randeep Singh Sri Krishan Bhalla Ji. All guests graced the occasion by their presence. 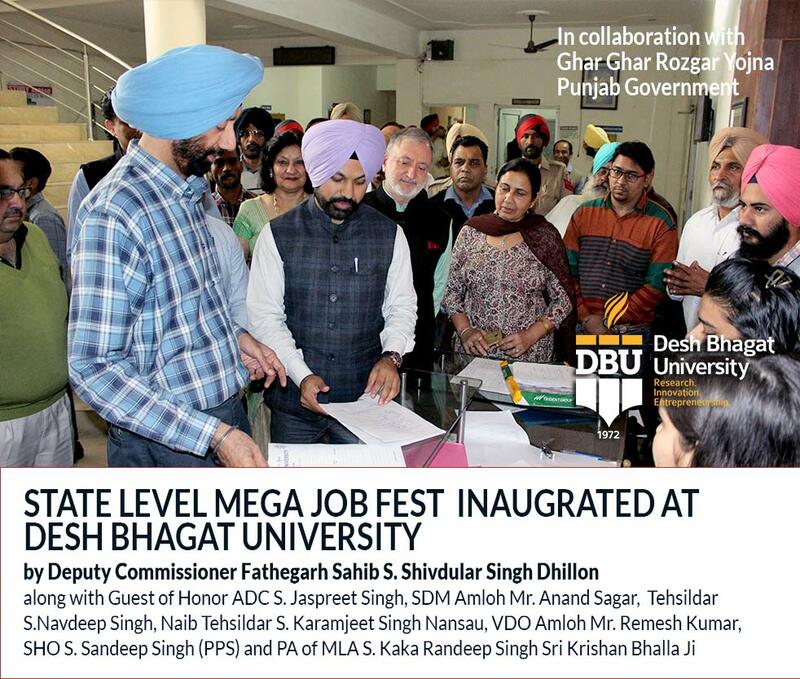 On this occassion Deputy Commissioner said that this mega job fair will provide a launch pad to give jobs to the youth who are educated and literate as well as who are uneducated. 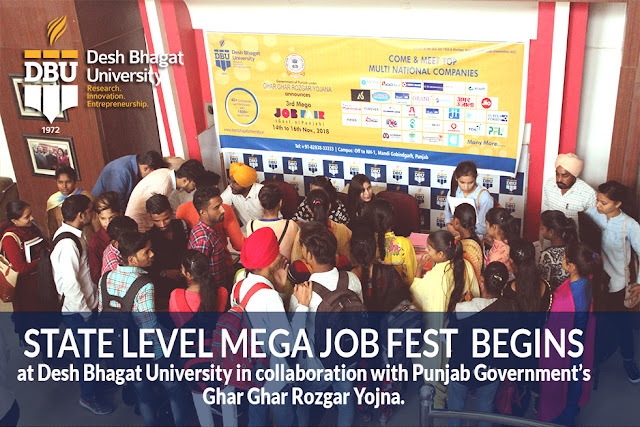 While giving details, Chancellor Dr. Zora Singh said in this Mega Event more than 40 well-known National and Multinational companies like SBI, Reliance JIO, Orane, Sportking, Cinif Technology, Touch Stone, Willowood Crop, C S Soft Solution, Solitaire Infosys, Kotak Mahindra Bank, Pix India Pvt. Limited, Edelweiss, Aviator Hub, Hoshiarpur Automobiles are participating. These companies came with 1600 vacancies of different posts. 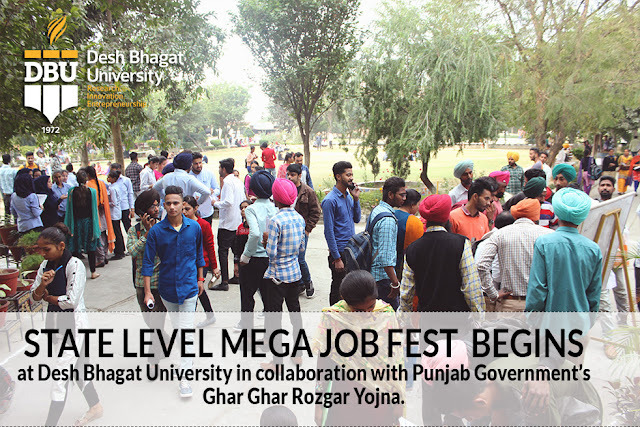 The event received huge success on its first day. Vice-chancellor Dr. Virinder Singh said that as a part of corporate social responsibility, the university has been organizing such job fairs on regular basis for providing suitable employment opportunities to candidates, not only for its own students but for the students of the whole North India. 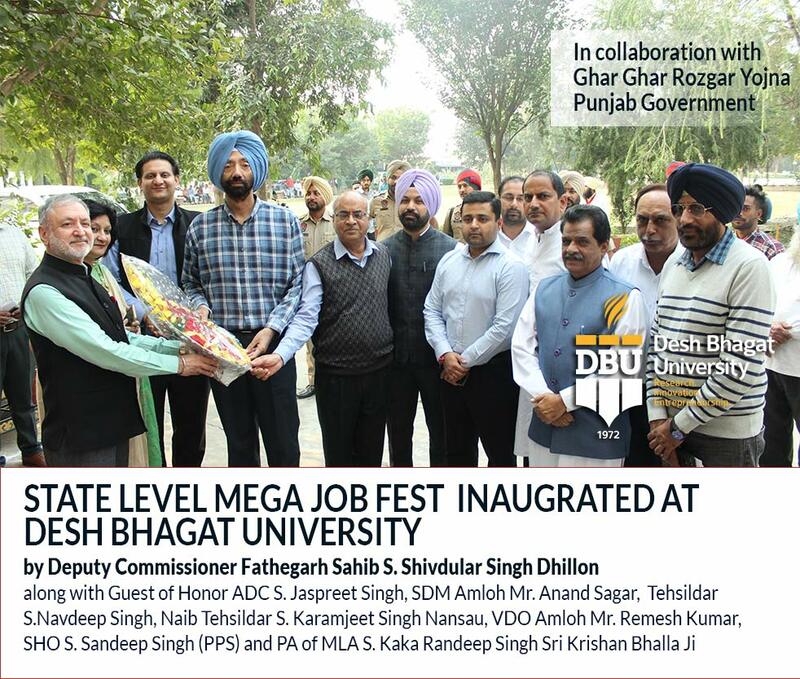 Desh Bhagat United Vice-President Er. Sandeep Singh said that the University organizes such Mega Fairs from time to time. The fair provided an opportunity to deserving students to get jobs in companies of national as well as international repute. Selected students appreciated the efforts of Desh Bhagat University and Punjab Government as they felt that they could have never got such a job through their own resources.